Build flotillas to colonize uninhabited islands and assault enemies' islands. Construct buildings to improve your islands and make them stronger. Destroy your enemies and don't let them destroy you. Tip: try pressing SHIFT key to view additional info about islands right on the map. 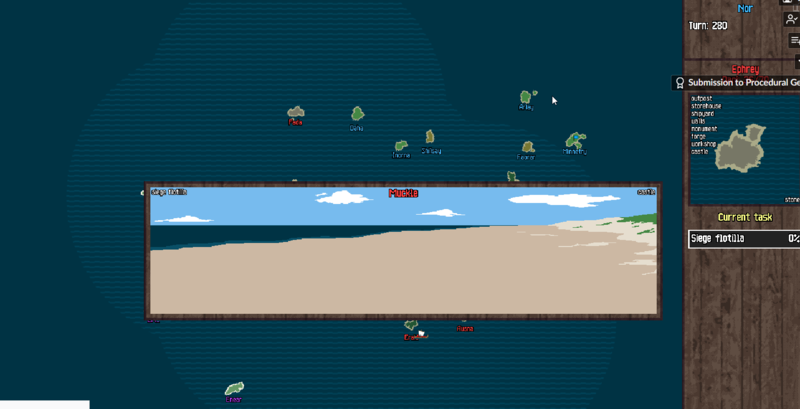 The game is created using Phaser. Always focus on Research, fellas! Only use your first island to colonise. New colony build order: Wall -> Monument. Prioritise big islands and game. Attack only when on significantly higher tech level. Excellent game, can't wait for the remake! Super addicting!!! 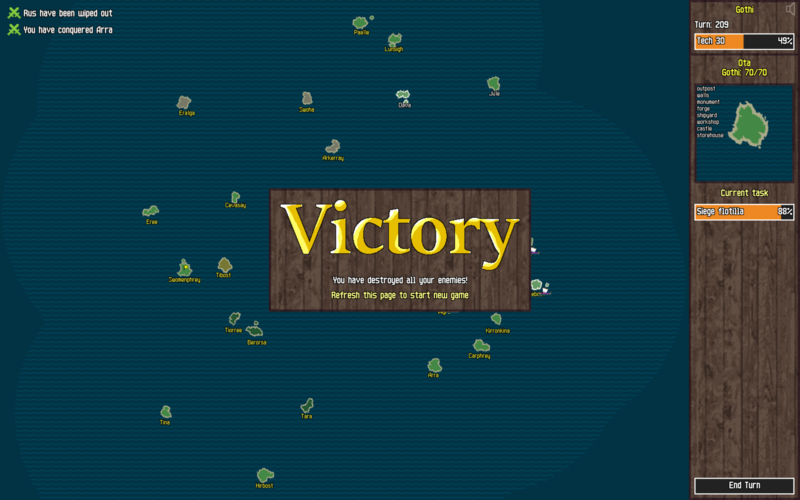 It took quite a lot of trial and error, but I eventually prevented any ties, and won the game. Simple, but engaging :) thanks Watabou ! 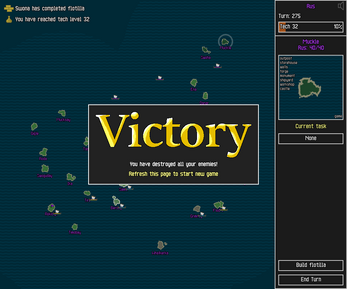 When you select an island which has a shipyard, the "Build flotilla" button is displayed. 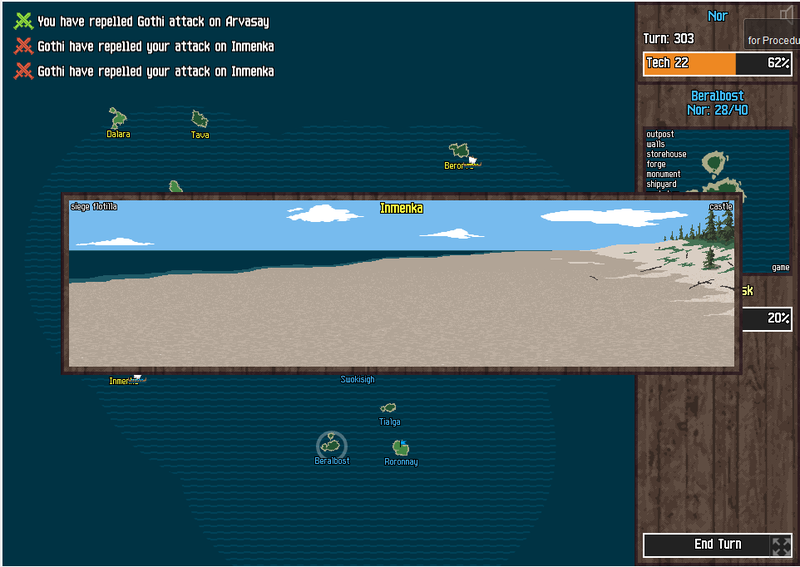 Click it to build a "flotilla". 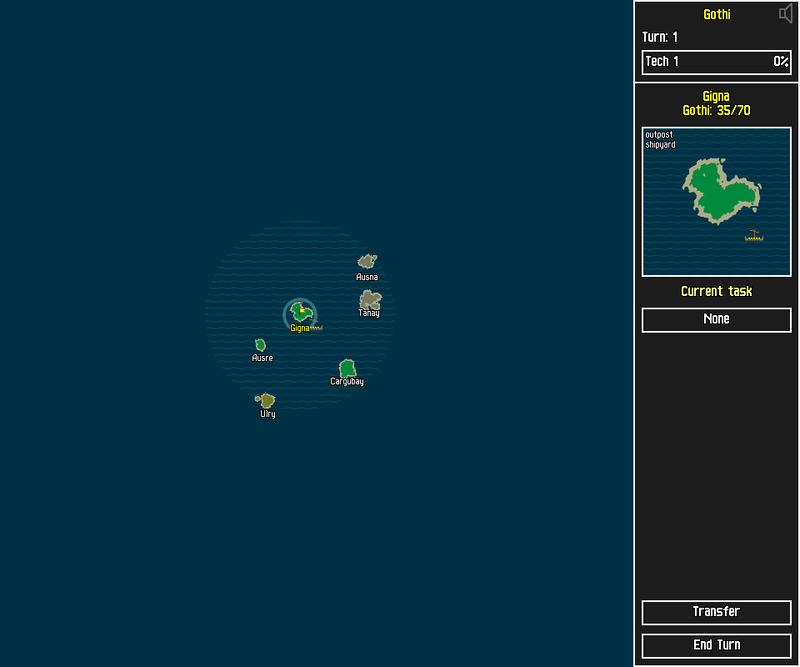 Once the flotilla is ready, you can transfer people from this island to another island (to colonize an empty one or to capture an enemy one). After that the flotilla is exhausted and you'll need to build a new one. 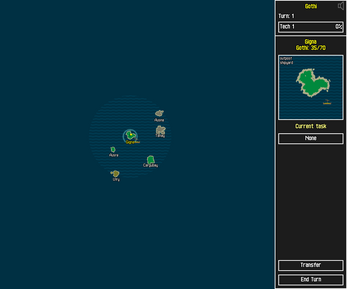 There is a tiny ship shown next to an island which has a flotilla ready. The short "BOOM" when a Siege Flotilla and Castle fought killed everyone. Without a clear victor the game froze. Really neat game. 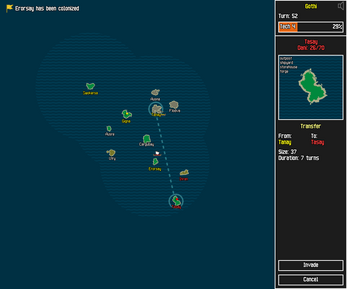 however, I sorta need the flotilla building for the enemy AI to be longer. I had more then 6 flotillas after me after I played for about half an hour. Think you can adjust that? Ok, I'll consider adding "easy mode" with AI enemies nerfed. Managed to somehow get a draw when a siege flotilla and a castle collided. 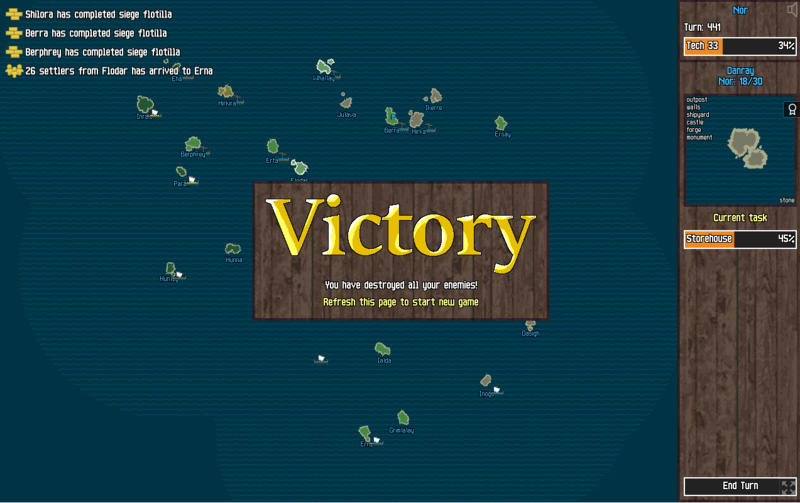 I could end turns but not remove the empty battle field from the middle of my screen... effectively lost because I could no longer manage the islands I could see, let alone the ones I couldn't. Love it otherwise. Wish there was more to it, though I'm not quite sure as to what there would be. Great little game! Somehow I think I had more fun with this than with Endless Legend (fewer hours though :D ). Amazing minigame. I was having so much fun until i managed to pull a combat with "draw game" and battle scene was broken. Before combat few soldiers were dying and both side killed eachother with that.. The MoO vibe is real. Nice one! Fun game, add a bit more to it and it would probably sell. Played again today and won! What a great game! 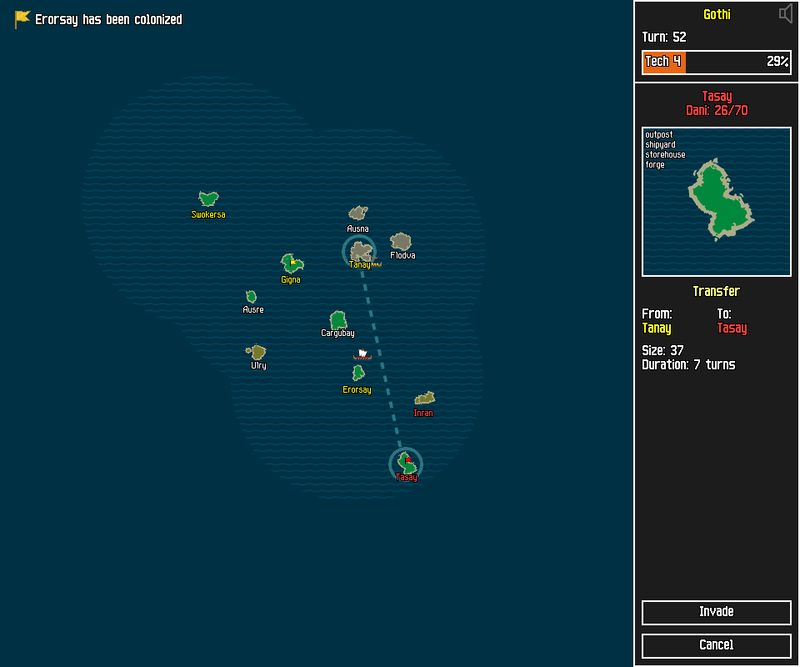 One suggestion, maybe make it a bit easier to attack than having to click your island, then transfer, then their island, then invade. It's ok when you're planning one or two attacks, but when you're trying to orchestrate 10-15 attacks at once, it becomes a little tedious. Found a glitch. If the enemies and defenders of an island all die at the same time, you can't exit the fight screen, or progress any further in the game. Fun game though, I enjoyed it. EDIT: Oh, looks like frshhh found it first! Very nice. I think the mechanics are simple enough that it could be really fun in real time. That would also make the end game more enjoyable in that more action would translate into a really hectic exciting warzone instead of a tedious series of battle screens. Anyways, I really enjoyed it! 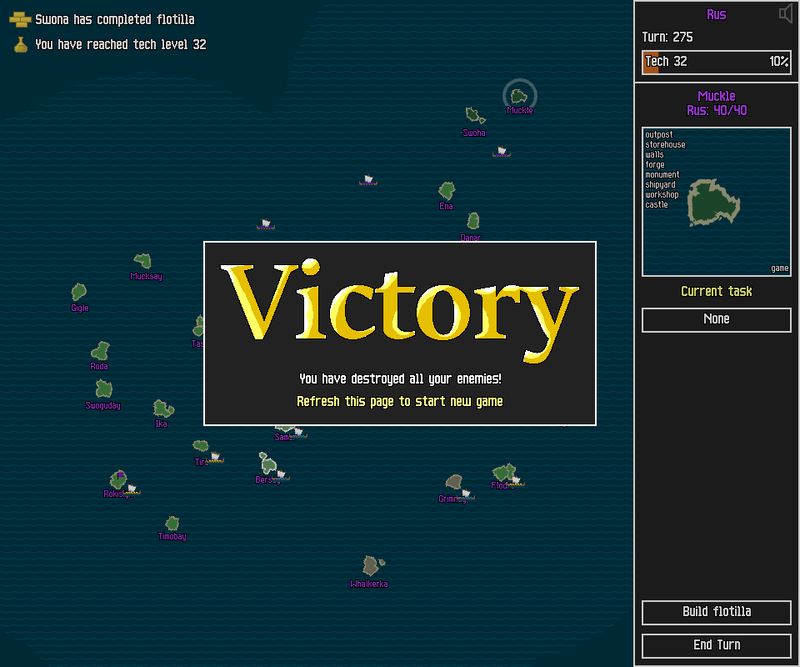 I attacked an island that had a castle with my siege flotilla and we both wiped each other out on the initial attack. This made the attack screen bug out and stayed there meaning I couldn't click anything... I could "end turn" by pressing return but I still couldn't do anything else. I just spent an hour playing/beating this. Great job! This was really fun! It reminded me of k240 on the amiga. Thanks! I haven't played k240 and for me Master of Orion (the first one) was the source of inspiration. But judging by the little info I could find these two have much in common. Played a single game of 40+ minutes and finally managed to eradicate the Gothi; it was really satisfying and felt well-balanced to me (until I got the upperhand in Tech level). Good job on your game! Is there a win condition, or some kind of dialogue when you beat the AI though? Nothing appeared when I conquered the last island on the map, and I cannot expand my field of view further. 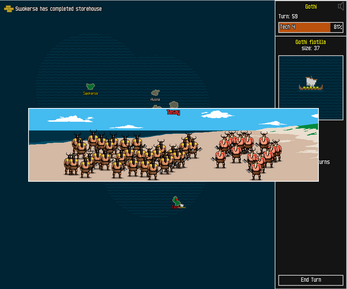 In each game there are 2 enemy tribes, so it looks like in your case one of them has been spawned on an unreachable cluster of islands, sorry. I considered such situation too unlikely to check for it, but it seems I was wrong.